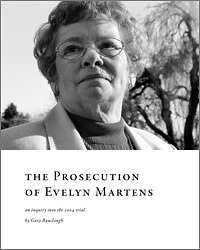 The Prosecution of Evelyn Martens is an 80-page digital book, written by Gary Bauslaugh, and designed by Rocketday. It’s available as a PDF, currently free of charge. On June 26, 2002, Evelyn Martens was arrested as she drove off the ferry in Sidney, British Columbia. This was the start of two and a half years of legal entanglement for Martens, involving brief imprisonment, shackling while being moved about, extensive interrogations of her and of her relatives and friends, frequent police harassment, and ending with her lengthy trial in Duncan, BC, in the fall of 2004. Martens was arrested as she was trying to return to her home in Langford, near Victoria on Vancouver Island. She had been in Vancouver to attend the suicide of the morbidly ill Leyanne Burchell. Martens was charged with assisting the suicides of Burchell and of Duncan BC resident Monique Charest, whose suicide Martens had attended some months earlier. Was she technically guilty, according to the Criminal Code of Canada? The Code prescribes a 14-year prison sentence for aiding or abetting suicide, but does not clearly define these terms. At issue in this trial was what, exactly, could be considered to be aiding suicide? Was it simply giving advice or attending a suicide, because Martens had certainly done both of those things. Or did it have to be something more than that? The crucial point in the trial came when Justice Barry Davies, in his direction to the jury, said that being guilty of assisting suicide requires more than advice or attendance; it requires some physical act in assisting, such as turning on a valve or handing out lethal pills. Is the law a reasonable one? Even if technically guilty, should someone like Martens, who quite clearly was committing acts of human kindness in responding to pleas from people who could get help nowhere else, be prosecuted and be sent to prison for lengthy terms? Or tried or sent to prison at all? Suicide is legal in Canada; does it make sense to have serious punishment for helping those who are committing a legal act? So both the interpretation of the law and the reasonableness of the law itself were themes running through the trial. Had the prosecution been able to prove that Martens was technically guilty — that she had taken some active physical role in one or both of the suicides, then the second issue would have likely have surfaced. Would the jury have followed the letter of the law, or would they have refused to convict because they felt that the law was unjust? This latter possibility — called jury nullification — never came into play because of Justice Davies’ ruling on assisted suicide and, given that ruling, the prosecution’s inability to prove their case. The trial was a landmark one, because of Davies’ ruling, and because it brought to public attention the need for more progressive end-of-life legislation in Canada. I really had no idea who Evelyn Martens was as I made my way to attend the first day of her trial, in my home town of Duncan, British Columbia. It was early October 2004. Why was she being prosecuted for assisting suicide? Why were there such strong feelings, widely reported in the press, about her and her case? I knew little about any of this, but thought that since the trial was nearby I would cover it for the magazine I was editing at the time — Humanist in Canada. End of life issues are of interest to the humanist movement because many of the common objections to suicide are based in certain religious beliefs. Humanists are always concerned when such beliefs appear to have influence on public policy. So I wanted to see what this trial was all about, but I had never taken a particular interest in end of life issues and was not especially familiar with those issues or the people who were involved with them. I was particularly curious, though, about some extraordinarily vitriolic attacks that had been made on Martens. I approached the small Courthouse in Duncan, located near a round public building that housed, among other things, the local Crown prosecutor’s office. I soon noticed a group of people outside the courthouse, some of whom were carrying signs in support of Martens. Some of them I recognized as being from a humanist organization in Victoria, about an hour’s drive away. There were a couple of television cameras as well and a number of reporters, and some other people I did not recognize. I later discovered that some of them were members of the Right to Die Society of Canada. Suddenly there was activity to one side of the Courthouse. Reporters with microphones and television cameras rushed over to intercept an attractive, dignified older woman who was walking in from the parking lot. Evelyn Martens had arrived. Without stopping or speaking to the reporters she went directly into the courthouse. The trial was the culmination of a two-year prosecution process during which Martens had been subjected to a detailed police undercover operation, then arrested, jailed, shackled at times, and had her bail appeal fought by prosecutors. She had been harassed by police in her home, been subjected to abusive accusations by certain organizations, undergone lengthy pre-trial sessions, and now was faced with the very real possibility of a 28-year jail sentence. How had she warranted all of this? Was she a bad and dangerous person, as all of the actions by the police and prosecutors and all of the resources devoted to this prosecution, and some of the public commentaries about Martens, would suggest? I began to learn the answers to these questions as I became absorbed by the riveting events at the trial, and by this calm and thoughtful woman who was under such intense legal scrutiny. I got to know her as we often spoke in the courthouse hallways during breaks in the proceedings, and I had many conversations with her after the trial as well. What struck me at first was the remarkable similarity between Evelyn Martens and the fictional Vera Drake from the great Mike Leigh movie of the same name. Vera Drake risked her freedom, before abortion was legalized in Britain, to help desperate young women who could find help nowhere else, eventually being caught and prosecuted for her acts of kindness and mercy. Evelyn Martens risked her freedom, in real-life acts of kindness and mercy, to help those desperate to end their own declining lives. And now Martens own life — at least the freedom to live the rest of her life outside of prison — was in very serious jeopardy. How had it come to this? Now if you admit that a man vested with omnipotence can abuse it against his adversaries, why not admit the same concerning a majority? Have men, by joining together, changed their character? Martens appeared to be innocent of the charges laid against her, but what if public opinion against her turned out to be so strong that the decision of the jury reflected that view? Do juries often act in a way that defies public opinion? De Toqueville thought not. Even in the original O J Simpson trial the jury’s egregious decision reflected the majority view of the community from which the jurors came — that Simpson was yet another a victim of racial injustice. And in the case of the Martens prosecution the most visible and vocal constituency was one demanding that she be found guilty. This of course is another problem with democratic processes: not only is there a “tyranny of the majority,” that power of tyranny is sometimes hijacked by an aggressive minority. Maybe, in the Martens case, public opinion and the opinion of the jury had been shaped by forces other than the evidence presented at the trial. A variety of people attended the Martens trial: reporters, opponents and supporters of Martens, and observers of various sorts. Sometimes, particularly near the end of the trial, the observer seats were almost full, with perhaps fifty or so people. I was there the entire time, as were perhaps eight or ten others, but many others appeared for shorter periods. Martens’ son Les Poelzer quit his job in Alberta so he could attend the complete trial. But people hostile to Martens were always there too. During a few days near the end of the trial a severely disabled person was wheeled into the courtroom, apparently as an unofficial exhibit. The purpose of this appeared to be to suggest that people like Martens, in favour of assisted suicide, would cause the deaths of innocent handicapped people like the one in the wheelchair. There was no way of knowing if such things had any influence on the jury. All of us there, though, probably came to the same view in regard to the significance of what we were witnessing: this could well be a landmark trial. Perhaps it would influence future prosecutions; perhaps it would inspire new legislation. Also at stake, of course, was the future of the small, older woman, who had been under investigation for two and a half years by the formidable combined forces of the RCMP and the Crown Prosecutor’s office. They probably spent at least a million dollars on the case. Martens was 73 years old at the time of the trial, and if found guilty on the two counts of assisted suicide, could have been given a sentence of 28 years in prison. Martens never seemed the slightest bit cowed by the state powers that were arrayed against her. Nor did she seem particularly bothered by the constant presence of a member of the Euthanasia Prevention Coalition, an organization that had applauded her arrest. In a newsletter published shortly after her arrest they had proclaimed “death zealot kills two.” During the trial their representative, Beverly Welsh, was quoted in the press saying that she hoped and expected Evelyn would go to jail. Martens remained resolutely cool throughout the proceedings — standing straight when the jury and Judge entered the Court, and then sitting calmly beside her lawyers, Peter Firestone and Catherine Tyhurst of Victoria. While her supporters often seemed nervous and uneasy, Martens showed little sign of concern. She felt strongly she had done nothing wrong — that she had helped people in severe distress who could find help nowhere else. “They can do whatever they want to me,” she said to me at a break. “Jail is not that bad.” It was a good thing that she felt that way, I thought, because she could well have been spending the rest of her life there. Instructions from British Columbia Supreme Court Justice Barry M. Davies had been given to the jury, following closing statements by the Crown and the Defence. Davies told the jury how to proceed and how to evaluate evidence. He also gave a lengthy summary of the cases for both sides. The jury had not been allowed to discuss the evidence until they were sent out for deliberations, after the Judge’s instructions, so it was likely that there were things they had to sort through. It was entirely possible that they would quickly come to the same conclusion I had come to, that the evidence clearly showed that Martens was not guilty of the charges against her. As the trial progressed it seemed to me that no compelling evidence against her was being presented, and I began to wonder why the Crown had brought this case forward in the first place — why they had subjected Martens to legal harassment for two and a half years since she was initially arrested, why they even arrested her in the first place. It was also possible of course that the jury would come to the opposite conclusion. Others in the gallery, Beverly Welsh in particular, seemed as certain of that as I was of my assessment. To Welsh, who was probably there the whole time, and various associates who came and went, there seemed no doubt about Evelyn’s guilt, something they expressed in frequent interviews with the press during breaks in the proceedings. The assuredness of these people made me wonder if I had missed something. And, even if I had not, did the views of Welsh about assisted suicide reflect public opinion and would they perhaps influence the jury’s decision, regardless of the technicalities of actual guilt or innocence? Those in Martens’ corner, resenting the continued attacks on Martens by Welsh and the Euthanasia Prevention Coalition, experienced one brief moment of shadenfreude. Welch was embarrassed when her cell phone rang two separate times in court, in rapid succession, prompting Justice Davies to ban all cell phones from future proceedings. In any case it seemed likely that there would be some disagreement amongst the twelve randomly selected people, and that at least some discussion and analysis would be necessary. Jury opinions must be unanimous, so even one person there who reflected Welsh’s opinions could result in a hung jury. I did not expect a sudden verdict. The last day was puzzling but fascinating, with a strange question from the jury, and with all the uncertainty about what was going on with the jury. It was most unsettling for Martens’ supporters. What indeed would the rest of the day bring? We did not know, of course, if there would even be a verdict that day. Were these the last few hours of Martens’ freedom? With the weeks of testimony, and long hours of waiting, and the scrums with media, and the talks in the corridor during breaks in proceedings, it was difficult to realize that it all would suddenly end, at any moment. It felt more like it was just something that was going to drift on indefinitely. But we all knew, of course, that very serious discussions were taking place amongst the jurors, and that sooner or later they would finish their deliberations, and a verdict would be rendered. As I waited with all the others who had gathered during the last few days, including many additional media representatives, I wondered about everything that had happened there in the previous month. Why had the police and the prosecutors pursued this thing so vigorously in the first place? How was the public interest being served? How could they have thought they would get a guilty verdict based on the weak evidence? But maybe the jury saw it differently. Maybe they, like the Euthanasia Prevention Coalition, would see Martens as a murderer. Beverly Welsh continued to look alarmingly confident. I wondered if any of the jurors had heard or seen anything from the Coalition. Certainly Beverly Welsh had spoken to the media at every opportunity. Some felt she was hoping to get at the jury, which had not been sequestered, trying to create the sense that Martens was indeed, without question, guilty. A Court Order prohibited the publication of such opinions, but she did get the Vancouver Sun, on the last day of the trial, to publish her comments about the desirability of sending Martens to jail. A contempt of court charge was entered against the Sun, but later was dropped after it became clear that the article had not influenced the jury. But what was happening in the jury room? That was all that mattered at this time. Late in the afternoon at about 5:00 pm there was a bit of activity in the corridor — something was happening. I caught Catherine Tyhurst going into the Judge’s chambers and she said all of the lawyers had been called in. She did not know what was going on. Then, maybe twenty minutes later, the Court reconvened. I went to my usual place up in the press box, with all of the other reporters and observers sitting in a now-crowded gallery. I was expecting that the lawyers would be responding to some issue the Judge had brought up in Chambers, but then the jury filed in. Then it slowly dawned on me that this was it. It was happening now. The jury had decided. Everyone in the Courtroom stood as the Judge entered. Martens stood with perfect calmness, seemingly unafraid. None of us knew what was going to happen. I wondered, if the verdict was guilty, if Martens would be taken away in handcuffs and shackles, as she had been when first arrested. Even before the Foreman read the second verdict we all knew in that moment that Martens was free.